Bad news for WBCS aspirants who opted Law subject as optional in WBCS 2018 main exam! 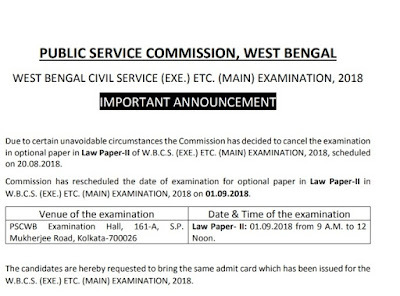 West Bengal Public Service Commission (WBPSC) public an official notification regarding the cancellation of Law Optional Paper-II in WBCS Main 2018 exam held on 20th August this year. Earlier same incident happened to Urdu Optional paper. The re-exam for WBCS 2018 Law optional paper-II will be conducted on September 1, 2018 from 9am to 12pm at WBPSC Office. 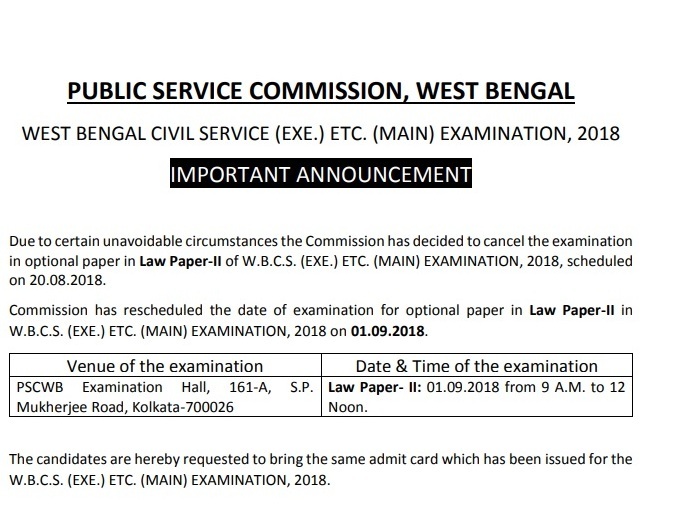 We are giving here the snapshot of official notification regarding the cancellation of WBCS Main 2018 Law exam. Keep your eyes on our website regularly to get any update regarding WBCS 2018 Main Exam. 0 comments for " WBCS Main Law Optional Paper II exam cancelled "